The family of Brother Ahmad Amer humbly invites you all this Wednesday June 4 at the Christiana Hilton at 6:00 PM. Brother Ahmad Amer was an active member of the community over the last 35 years. He has supported ISD, IAD, Masjid AlKawthar, CAIR and several other national causes. He help to establish bridges between the Muslim community and Local communities and government. May Allah guide us and help continue his Dawaa. Inna Lila wa inna Illahi Rajiun. I am very glad to announce that with the blessing of Allah (SWT) we have started our ISD board approved bathroom project for the community. This project had waited for 2 years. Alhamdulillah, the project is fully sponsored by generous donors from our community. Please make dua for the success of this project and for donors for their very noble and charitable cause. ISD Board of Directors met at its first Board meeting for year 2014-15 yesterday and appointed the following Individuals to ISD Executive Committee. 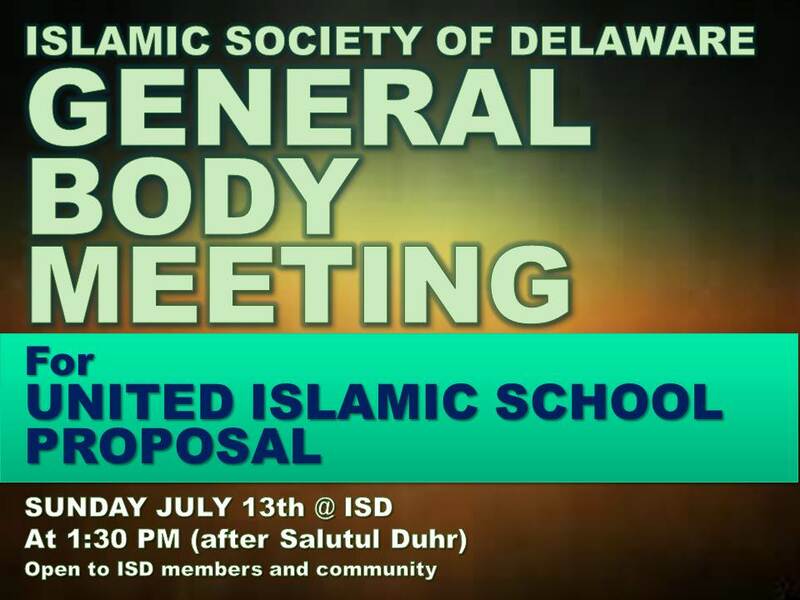 Islamic Society of Delaware General Assembly Meeting and Annual Elections for 2014-2014 will be held on Saturday May 3rd 2014 @ 2:00 PM at Masjid Ibrahim. Please find below the list of nominations for the ISD Board of Directors Elections for 2014-2015. Start off Meeting by Recitation of Quran – 5 mins. President address to Community – 10 mins. Financial Report from ISD Treasurer – 10 mins. Community Questions / Answers – 20 mins. Start of Election – 45 mins. Counting of Votes – 20 mins. Result Announcement – 5 mins. The first Board of Directors meeting for 2014–2015 will be held on May 10th.